Audrey, the eclectic seat combining aluminum and plastic and designed by Piero Lissoni is a versatile and contemporary chair which because of its simple, clean lines due to a special die-casting process is composed of only two parts and made without welding. It is multifunctional and adaptable to all uses - indoor, outdoor, the home, office and contract - with its wonderfully rich range of combinations (about 50 in all). 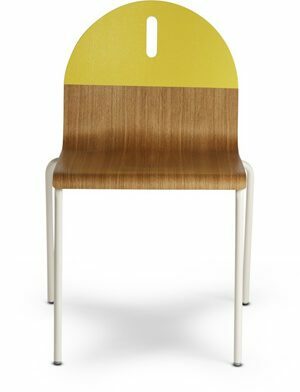 Audrey comes in either the chair or the armchair (with arms) version with seat and back in various colors of plastic and the aluminum frame has three versions: painted aluminum, painted white or painted black. This seat can also be used outdoors. Frame: Painted aluminum. Seat and back: Batch-dyed modified polypropylene.